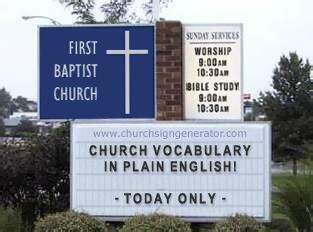 (Pentecostal) Church Vocabulary Lessons Here! This is just some good fun… please comment and add your own words and phrases. 2. Trick of the Enemy: Used to describe anything that happens because you didn’t do what you were supposed to, like your car getting repossessed cause you didn’t pay the note, lights getting shut off cause you quit work to go on tour with the pastors choir, or your child repeating the first grade cause he missed the whole second semester to go on a 90 day/90 night fast and consecration. 3. Rhema Word: Any message from an out-of-town pastor or evangelist. 4. Prophetic Word: Same message from that out-of-town pastor, delivered 5 decibels louder, while the congregation is standing. Quiet organ music optional, but works better with silence. 5. Carnal: Used to describe a saint who goes to the movies. This term doesn’t apply if you rent the same movie from Blockbuster. 6. Didn’t God Move? : What saints say after a long service where the pastor doesn’t preach and they just shout the whole service. 7. Unlock Your Blessing: What preachers say after they’ve finished preaching, and they say you must give $50 to “unlock your blessing.” For a more dramatic effect, this offering can be started at $1,000 and worked down to $25. 8. He’ll Do It If You Let Him (followed by inaudible tongues): Round one of shouting; will begin in 5 minutes. Organist get ready. 9. We Got To Move On: What the preacher says when he wants shout time to start up again. Organist, turn up the volume on the Leslie. 10. We Have Time for One More Testimony: Not really, we’re just waiting on the pastor to come into service. If you’re called on during this one, when you hear clapping, just stop talking, cause the pastor has walked in and people are no longer interested in what God did for you. 11. We Can Never Pay for the Word: Get your checkbook out, the auction will begin omentarily! This phrase always comes before the offering is taken for the guest speaker. 12. God Has Been Dealing with Me on Some Issues: I’m still doing what I was doing before I got saved, only now I just put in an extra $5 in my offering when I do it. 13. Is He Worthy? : Of course He is; why ask a question like that. 14. Let Us Go To God in Our Own Way: This is what you say when they ask you to pray in church and you don’t know what to say. 15. Get Ready, Get Ready, Get Ready!!! : Don’t really know what this one means, but if you’re not careful, a shout could break out when you say it. It must be said three times to have real impact. 16. I Can’t Get No Help: Preachers say this when no one says amen in the spot they thought would get a lot of amens. 17. I’m Blessed and Highly Favored: Said when a fellow saint asks “how are you?” Memo to saints: you CAN be saved and answer “fine” when someone asks how are you. 18. Where The Spirit of The Lord is, There is liberty: Whenever you want to disrupt service and holler out when it’s quiet, use this statement to justify your behavior. 19. Get Ready To Go To The Next Level: This means the church will be hosting another revival in a few months. 20. Stand To Your Feet : This gives the illusion that the preacher is finished, but be prepared to stand up for at least 1/2 hour. May be cut to 15 minutes if the organist starts playing softly. 21. Give God a Shabach: Scream to the top of your lungs. Some church members may blow whistles and wave flags as well. 22. Every Head Bowed, Every Eye Closed: Quick! Everyone look around to see who’s getting saved again this week. 23. Secular: Any person, place, object or event that’s not in the church. 24. The “Yes Lord” Song: Signals the official end to shout time. Anyone still shouting when this song is over is considered to be “in self”. 26. In The Spirit: When three people are doing the same thing in a church service at the same time. 27. Spirit of Confusion: When everyone is tired of those three people and another bunch of folks start doing something else. For example, three people shouting, and another three people start singing. 28. Demonic Spirit: Add a tongue-talker and a prophecy to the above act (all at the same time), and the preacher declares a demonic spirit. 29. Cast the Devil Out: The preacher is tired of this fiasco, and wants all of the above players to sit down. 30. All things must be done in decency and in order: Closing speech after casting the devil out. Everyone has crossed the line and must sit out two services before participating again. 31. Prayer Partner: Phone buddy. 5 minutes of prayer, 1 hour of church gossiping. 32. Prayer Warrior: Anyone who prays really loud and for a really long time. 35. “I asked God what I should say to the people“: really means: I’m still trying to think of something deep to say. 37. “Tarry for the Holy Ghost“: this ritual involves the most harsh and loud church members ganging up on anyone deemed not yet “baptized in the Holy Ghost” yelling in tongues and slapping the victim on the back until they spit up, pass out, or start yelling in tongues too. 38. “Backslider“: name given to any church member who’s absent without their name being on the “sick and shut-in” list. 40. “Tomorrow is not promised” – somebody come down to the alter for prayer before I tell the ushers to hold the doors! Bonus: “Ushers hold the doors!” — I know I preached too long but nobody is gettin’ outta here till somebody comes down to the front and gets saved again!